In the days of old, shopping for deals was a Herculean effort. One had to call different retailers, hit the bricks in search of hidden treasures, or clip real analog coupons by the binderful. While these three techniques are still very much alive, saving big on routine purchases is made much easier by today’s consumer technologies. So for all of you who love to pay less, at every opportunity, here’s how today’s pros go about it. Online Deal Aggregators. These are basically free (or very nearly free) services which pull together deals from across the web and make them available to you. Think of it like old-fashioned coupons, but for the entire retail sphere. When it comes to this model, there are good providers and bad ones, as any simple Google search will reveal to you. I have found some that I really like, including Dollar Dig for reliable cashback and Honey for general savings at checkout. But there are lots, lots more. To dig deeper, I recommend doing some reading in the online retail savings community. There’s a deals blog for every savings strategy, and you’ll quickly learn the ropes. Good Old Fashioned Negotiation. This perennial savings strategy is alive and well. It’s just as powerful an art (and as difficult to master) as it was in the days when humans were trading deer pelts for arrow heads. The trick is knowing when and where to drive for a better price. Negotiation is powerful because Cash is King. If you are dealing with a private seller, or even a major retailer, for whom a fast sale is important, it’s likely that you will be able to negotiate a better price. This is most effective with major purchases, especially when dealing with a re-seller. Try your luck at asking for a better price on automobiles, major appliances, sale or reduced items, and anything that a seller bought and then marked up for resale. You can also negotiate loan terms with major lenders. These institutions frequently fluff up their margins, more than they actually need to make meaningful profit. So don’t be afraid to play hardball. Digital Couponing. The coupon is alive and well in 2015, friend to grocery shoppers wherever megamarts operate. But you no longer have to buy up countless papers and get that awful newsprint stuck beneath your fingernails. Today, coupons are digital. There are plenty of apps which both find and store coupons (that you can actually use), right on your smartphone. I have found that 15 minutes spent looking, prior to going on a weekly grocery store visit, usually reduces my spending by about 25%. Performed weekly, this little operation could save $1000 a year, or more. So forget the scissors and the binder. Check out your app store for the best reviewed couponing apps, and start to pile up savings at the register. Deal hunting is an art and a calling. It’s not for everyone, but it rewards those who master it. 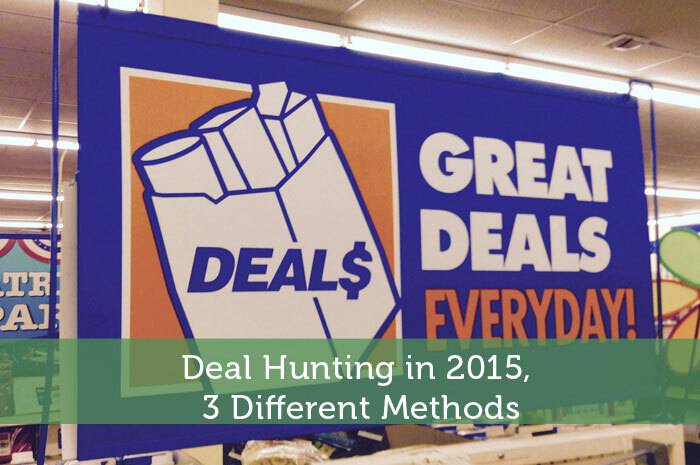 Deal hunting best practices are always changing. The best deal hunters are always learning new techniques, adding arrows to their quivers. So modernize your tactics. You’ll save a lot of money doing so. I’m personally not big fan of coupons, however, I do have Honey app installed and so far so good. I can also say that Paribus has saved me quite a bit as well. Why pay the full price when it is possible to get it for less! Don’t forget that using online coupons can MAKE you some money, as well as save it. Use Coupons.com through loyalty sites (Inbox Dollars, Swagbucks, etc) and get about 10 cents for each coupon you redeem. Just to make your savings that much sweeter! Deal hunting definitely is an art! I always try and participate but I am not that good at it. I have much more success with rewards programs like the Shoppers Optimum program and the PC Points rewards program. For some reason, this just clicks with me and I have had huge success. Ibotta is another great app that gives you cash back on purchases that you’re already making like groceries, clothing, electronics, etc.It’s pretty easy to browse for deals once you get the hang of it.